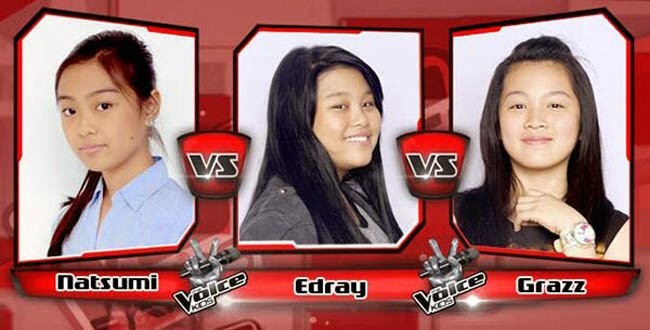 The last battle for Team Bamboo was among Edray, Natsumi and Grazz. These three were so close to each other that is why it was hard for them to battle. The good thing is that they understood that despite the fact that they were battling, they are still friends. The three were set to perform “Breakaway” that caused them a lot of challenges. There were comments wherein during the rehearsal, there were parts of the song that they go first and that brought wrong timing to the performance. Coach Bamboo reminded them to be calm and slow down since they were going first than the song. He emphasized the importance of timing. Despite this, the three did a very powerful performance. The song was not easy to sing but they did their best and they did well. The three coaches gave comments to the three of them. Starting with Coach Sarah, she said that Natsumi’s voice was so powerful, Grazz voice was so sweet along with her personality, while Edray’s voice was natural. Coach Leah said that Natsumi was like a bright light and she liked the texture of Edray’s voice. The two both chose Edray as the best among the three. Coach Bamboo was almost speechless that time and she complimented to the performance of the three. He had been with them through the training and she knew very well what they went through. While he gave compliment to the three of them, Coach Bamboo still chose Edray to advance to the sing-off. This is because Edray has shown a very powerful performance because of the quality of voice. Will Edray make it to the semi-finals? Let us watch her perform in the sing-off wherein 6 from Team Bamboo who made it will battle for the two spots to the semi-finals.